Note that some 2013 batteries read low although they did have normal range. Also, replacement battery readings often start low and take several weeks for the LEAF to learn and report accurate capacity. First report I have read of such low values on a 2015, but very few have tested and reported on brand new 2015s. Very likely dealer and Nissan will want to wait several weeks before being concerned about the reported capacity. And on the 2013's that reported low I don't think they did anything on those as the real driving range was normal. Thanks for the insight Tim! I will keep an eye on it over the next few weeks and see if it chages, but so far it is very consistent at 56.36 kWh. achronox wrote: Thanks for the insight Tim! I will keep an eye on it over the next few weeks and see if it chages, but so far it is very consistent at 56.36 kWh. You might need to fully charge and then discharge a few times so the BMS can see the top and bottom of the cycle and learn the usable range. Bryon wrote: I will send you the 2.1 and the CD that came with it. I'll PM you for an address. It isn't worth the effort of sending back and maybe it would read codes on my Z06 or jeep if this doesn't work. I have analyzed the version 2.1 ELM Bryon sent me and determined that it just does not support the required commands. It only supports the limited set that Torque needs to use which is very basic since the ELM knows the ECU IDs for ICE vehicles and supplies the necessary flow control responses without needing to be programmed. 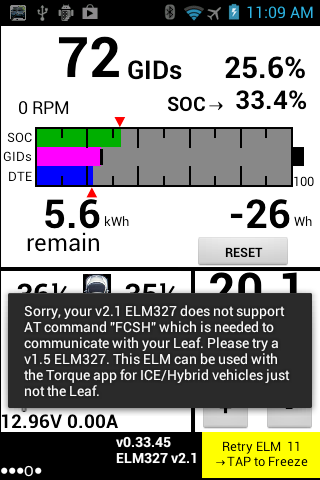 Leaf uses totally different ECU IDs so the ELM needs to be told what they are which 2.1 (some maybe all) don't support. This is a clone ELM327 bug in that the official spec for v2.1 supports all the commands from v1.5. For now I would stay away from any ELM327 listed as being v2.1. For clones this means a cost reduced version as there are only 2 circuit boards inside instead of 3. Being listed as v2.1 does not mean it supports the official v2.1 AT command set or even the v1.5 command set. I have added code to give a message when Leaf Spy detects an ELM that does not support a required AT command. Here is what it will look like. This message stays on screen for a fix time even if you exit the app. It also will display again if you change screen orientation. My thanks to Bryon for sending me this v2.1 ELM. I have two more v2.1s on order to see if they also have the same problem. I have finally gotten around to updating Leaf Spy Lite with all the latest improvements. The test version (0.28.17) has just been uploaded to PlayStore. It should take about 90 min to show up there. If you are in the testers group you can use the following link to install it. It does include a couple of retry enhancements not yet included in Leaf Spy or Pro. It should handles the case of getting stuck at the "Service Start" or "Retry Leaf 00" state. Hi, I just got this adapter: http://www.ebay.com/itm/310917778774 - but it doesn't work.. It is supposed to be compatible with leaf, at least I have it on good authority that other people from the Norwegian Leaf forums bought it and for them it works fine. I get a message saying that "the adapter is a version 2.1 adapter, and that I should use version 1.5 adapter, because this one just supports hybrid cars" or something.. and that the adapter doesn't support FCSH command.. Any ideas? Can see noone with this problem. Tried leaf spy pro as well..
krisrst wrote: Hi, I just got this adapter: http://www.ebay.com/itm/310917778774 - but it doesn't work..
What is important is what AT commands the ELM supports. If it were an official ELM from the original manufacturer then both 1.5 and 2.1 would work as they both support all the commands that are needed to talk to the Leaf. However, these ELM clones can support or not support any commands they want independent of version number they list or report. For this reason I have added this message to alert users to an ELM that is rejecting a needed ELM command. The outside case on all these mini ELM327s all look alike but the inner electronics and firmware can be different. The good news is they are not that expensive so I would recommend trying a different vendor. Although the same vendor might get different batches of these from different production runs so even two from the same vendor bought at different times could be different inside. This unit was shipped to me with v2.1 and is not working . doggyollie wrote: This unit was shipped to me with v2.1 and is not working . Thanks for reporting that. Did you get the warning message that says it does not support a required AT command? I have just ordered on for testing. I did get the message. I could send you this unit if you want to cancel your order. Let me know.